Small Sanities: "We Will Pull No Punches"
"We Will Pull No Punches"
Yesterday, New York City Council Speaker Melissa Mark-Viverito delivered her annual state of the city address in the Bronx. 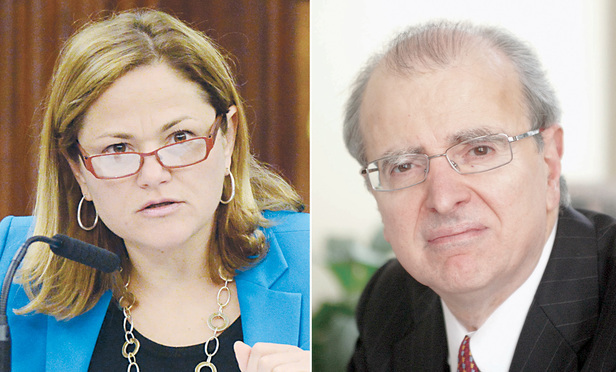 The big news is that Mark-Viverito has launched an independent commission, to be chaired by former NY State Chief Judge Jonathan Lippman, to create a new "blueprint for justice for New York City." Specifically, Mark-Viverito charged the Commission with reducing pre-trial detention, "utilizing more community courts," and getting the population of Rikers Island "to be so small that the dream of shutting it down becomes a reality." To state the obvious, this is an ambitious agenda. But I can think of no one more equipped to take this on than Judge Lippman. "We will pull no punches," Lippman told reporters yesterday. "We will look at Rikers like it's never been looked at before, and with no preconceptions. It's important that the criminal justice system be viewed as fair and that crime and punishment is done the way it should be." Will this Commission lead to fundamental change of the justice system in New York City? To be honest, the obstacles will be enormous -- political, financial, logistical, etc. But it is worth pausing at least for today to appreciate that one of the most powerful elected officials in the City has put her weight behind reducing incarceration and advancing community justice. No small thing.